As user interface designers, software developers, and yes-as users, we all know the frustration that comes with using "one size fits all" software from off the shelf. Repeating the same commands over and over again, putting up with an unfriendly graphical interface, being unable to program a new application that you thought of yourself-these are all common complaints. The inflexibility of today's computer interfaces makes many people feel like they are slaves to their computers. Shouldn't it be the other way around? Why can't technology give us more "custom-fitting" software? On the horizon is a new technology that promises to give ordinary users the power to create and modify their own programs. 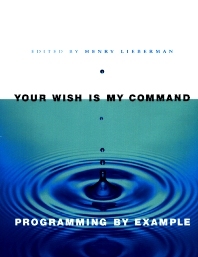 Programming by example (PBE) is a technique in which a software agent records a user's behavior in an interactive graphical interface, then automatically writes a program that will perform that behavior for the user. The renowned authors and their editor believe that PBE will some day make it possible for interfaces to effectively say to the user, "Your wish is my command!" Professionals involved in the areas of HCI and AI, designers of complex systems and programming environments including researchers and software developers specializing in agent technology. Henry Lieberman has been a Research Scientist at the MIT Media Laboratory since 1987. From 1972 until 1987, he was a researcher at the MIT Artificial Intelligence Laboratory. His work focuses on the intersection of artificial intelligence and the human interface. Dr. Lieberman began his career with Seymour Papert and the group behind the educational language Logo. A member of the Software Agents group, he holds a doctoral-equivalent degree from the University of Paris-VI and has published over fifty papers on a wide variety of research topics.